The spot for Uncle Julio’s menu prices. An authentic dining experience is the best way to describe a visit to Uncle Julio’s restaurants. Serving original recipe, Mexican dishes made from scratch using fresh, hand-picked ingredients. Uncle Julio’s first location popularized a now famous drink named The Swirl. It is a frozen drink that combines a margarita and a layer of sangria. Menu selections include a variety of mesquite grilled fajitas, enchiladas, tacos, fresh-made salsa & guacamole. Uncle Julio’s also serves up kids choices and delectable Mexican desserts. Below is the latest Uncle Julio’s menu with prices. Looking for a new place to hold a team party, work outing, or birthday gathering? Uncle Julio’s offers special group menu choices and private rooms. Check with your favorite location to get more details. Want to make a splash at your next fiesta (that’s Mexican for a party)? Have Uncle Julio’s cater your next event and have everyone leave with a happy face. Authentic border-style Mexican food prepared and delivered by Uncle Julio’s is sure to be a big hit. No matter the occasion, Uncle Julio’s is the right call. When time is short and you crave authentic Mexican food, you can pick up Uncle Julio’s to-go. Call in your order with your favorite Uncle Julio’s location, an estimated pick up will be provided for you. Stop in and get your order. It’s convenient and fresh! A perfect way to show family and friends that you have great taste is to hand out Uncle Julio’s gift cards. You can purchase gift cards online or in store. Join Uncle Julio’s Amigo Especial Loyalty Program where members earn points for every dollar they spend, redeemable towards food items. Sign up is easy and free. Check website for details. Motivated, dependable, and friendly team members are always welcome at Uncle Julio’s. If you are looking for an exciting opportunity, head over to the Career page on the Uncle Julio’s official website to see the list of current openings. 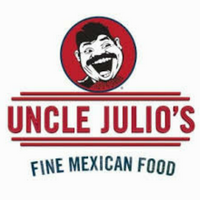 The first Uncle Julio’s location opened in November 1996, in Dallas, TX. Today there are 21 locations in 7 states with plans for more. Come back and visit. Ole! You can follow Uncle Julio’s via various social media platforms. To learn more about Uncle Julio’s restaurant, visit their website.